In June 2009, Indian Prime Minister Dr Manmohan Singh's Council appointed Dr Nandan Nilekani as the Chairman of the Unique Identification Authority of India (UIDAI) with the rank and status of a Cabinet Minister — probably the only 'Cabinet Minister' who has not taken a formal oath abiding by the Constitution of India. The key task of the 'Cabinet Minister' was to advise and implement the UID scheme in India in the next five years. In less than two years, Nandan Nilekani became the centre of criticism — his own colleagues from Planning Commission and Home Ministry to ordinary masses in the country. Former Defence Minister Jashwant Singh called Nilekani's scheme a "madcap scheme". The UID scheme which already spent Rs 3,500 cr and is expected to spend another Rs 100,000 cr for the final implementation of the scheme — all from poor taxpayer's money. Introduced as a proof of identity, the Aadhaar card was later projected as a card of 'benefits'. The result — denied benefits to millions of Indian citizens who walked the dusty roads and struggled several months to get hold of their Aadhaar card, the 'benefit' card. The UID Scheme is one of the biggest scams of the century — introduced and implemented by a public servant who's supposed to 'guide' the Hon Prime Minister and the nation. If implemented, India will be the only country in the world to have such a unique number challenging the constitutional rights of citizens. After September 11 attack on the World Trade Centre and Pentagon in USA, there were attempts in all countries to tighten security in order to benefit Uncle Sam. UID is nothing but an initiative to create a data-base for national security, and the Aadhaar data base would be eminently suited for that purpose. It is noteworthy that Aadhaar is apparently linked with the National Intelligence Grid (Natgrid) and the National Population Register. Since biometric based unique card systems are rejected by the entire world, the Unique Identification Number launched in India can only be compared to 'People's Card Index' (Volkskartei), introduced by the Nazi Germany in 1939 to control the German population and punish non-abiding Jews. And in February 2014 Dr Nandan Nilekani shocked the nation when he decided to resign as the Chairman of ambitious UIDAI project much before completing his term to contest the Lok Sabha election from South Bangalore on a Congress ticket, a party he never joined! 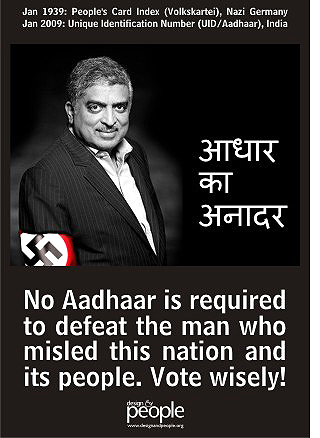 Design & People launches its "Aadhaar ka Anaadar" campaign in South Banglore, the constituency chosen by Nandan M Nilekani to contest the LS election.